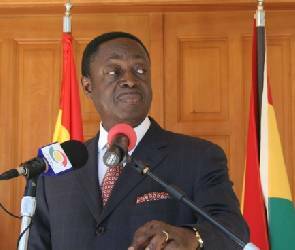 Former Finance Minister Dr. Kwabena Duffuor has called on Ghanaians to unite and resolve the minor challenges the country faces. According to the founder of the HODA group (House of Duffuor and Associates), the minor challenges confronting the nation must not be allowed to derail the focus of the country in achieving its development agenda and bequeathing a better nation for an unborn generation. Speaking to Nii Arday Clegg Thursday, on the occasion of his 73rd birthday on Morning Starr, the former Governor of the Bank of Ghana said every evolving society faces challenges and it is normal for Ghana to face some challenges. “I have been observing what is happening in our country now and I would be very honest with you, Ghana is a very great country, it is a very special country and what we are going through now to me are minor challenges which must not disturb our forward march to development,” Dr. Duffuor said. The oil producing West African nation has experienced severe power crisis in the last three years which has hit industries hard forcing some major companies to cut down on its staff. The economy has also faced crippling challenges with the constant rise of the dollar and high inflation rate. The nation’s cedi has also been described as one of the weakest currencies on the African continent. Utility tariffs and fuel products have been increased astronomically forcing the Trades Union Congress to stage a demonstration to pressure government to reduce the utility tariffs and fuel products.